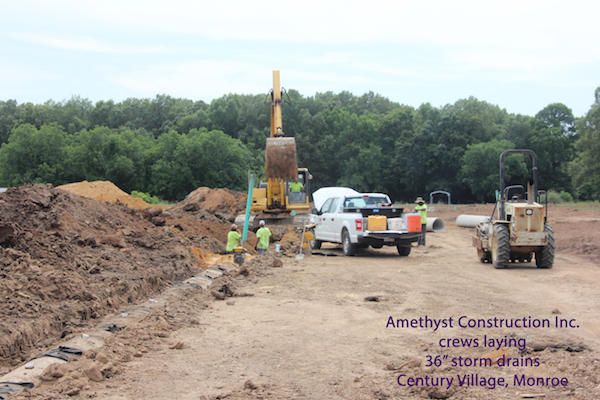 Amethyst Construction Inc. based in West Monroe provides turnkey site development quotations for numerous large and small projects. We assist developers during the design phase to insure that each project fully utilizes the full potential of the site chosen. We include clearing & grubbing, excavation and embankment, drainage and drainage structures, sewer, water, site utilities, curb and gutter, base and paving, sidewalks, concrete footings, striping, irrigation, landscaping, pavement striping, and other required items in our package of work. This turnkey approach has proven to keep projects on schedule and provide competitive pricing on each project. Call us on your next development in Northeast Louisiana and we will gladly work with you to get your project completed on time and at a very competitive price.